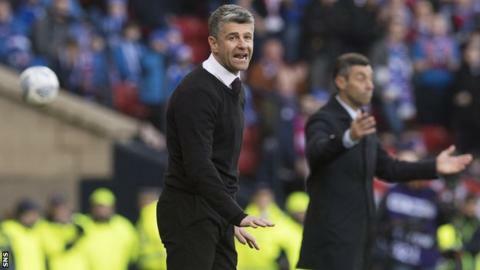 Manager Stephen Robinson has dismissed criticism that Motherwell are a "dirty" team. Rangers defender Bruno Alves said Well's physical approach in their 2-0 League Cup semi-final win on Sunday was "too much" and "not football". Robinson told BBC Radio Scotland's Sportsound: "We're an aggressive side. We're physical. We're strong. "We're not dirty but we want teams to know they're playing against us and hopefully Bruno knew he was in a game." Ryan Bowman broke Rangers defender Fabio Cardoso's nose with an elbow in a match when four Motherwell and two Rangers players were booked. Robinson added: "Bruno's made a living out of being physical and he was physical as well. "I'm not too worried about what anybody else says. If we've got Xavi and Iniesta in midfield, we'll play total football. We haven't. "We know what we are as a football club and what our limitations are and we try and make the best possibly out of it." Motherwell will meet holders Celtic in the final at Hampden on 26 November. Robinson and Rangers counterpart Pedro Caixinha were sent to the stand after a spat on the touchline. "Pedro, who's wanting to win the game as much as me, thought one of our players should've been sent off and I disagreed with him, as you do," said Robinson. "You stick up for your own players, don't you? "Perhaps the referee could've just come over and told us to calm down - realised it is a massive game for both clubs for different reasons. "It's not about any personal issue. It shouldn't be about us. It should have been about the players and their performances." Robinson, who said he "didn't get chance" to speak to Caixinha after the game, added: "I have no problem with Pedro in any shape or form and he's always been very courteous to me and very respectful, as I would be back to him." Celtic, the reigning Premiership champions, are top of the table this season and are unbeaten in 60 domestic games. "We'll go and try and make a real game of it," said Robinson. "It's a difficult task. We're not kidding ourselves. We've got to have players on top, top form and we've got to hope we have a little bit of luck on our side. "Why not? It's a one-off game. If you don't go in with any kind of belief, there's no point in turning up."